I love Ana White and her fabulous blog! I have had this laundry basket dresser pinned since the first time I saw it...which was probably before Pinterest was around! 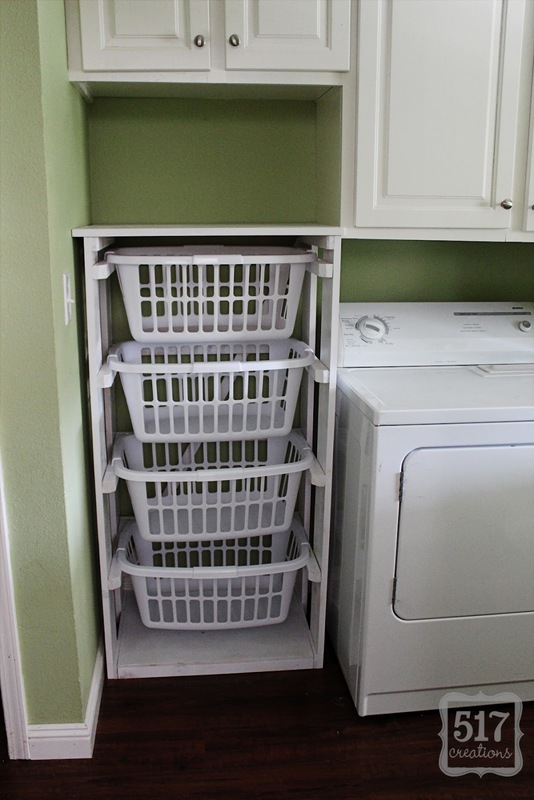 :) The laundry basket dresser seemed so practical and an actual piece of "furniture" in the laundry room. We started out with one of those fabric laundry sorters, which did it's job, but it was difficult to reach down into all of the fabric bags to get the laundry out. So, when my parents were here visiting a few months ago, I asked my dad to build me my very own laundry basket dresser to fit the space perfectly. He actually just looked at a picture and created his own version, but it's similar to the plans that Ana White shares. My new laundry basket dresser has an open back, to let it "breathe" (according to my dad) and open sides.The dimensions are a little different in order to fit our space perfectly, but it still uses the Sterlite laundry baskets that the other dressers use. I plan to find a galvanized bucket to sit on top to corral my cleaning supplies and to keep other stuff from piling up there! I'm also going to add some type of labels to the laundry baskets to separate them - maybe some cute chalkboard labels?? Our laundry room has come a LONG way since we moved in nearly two years ago. 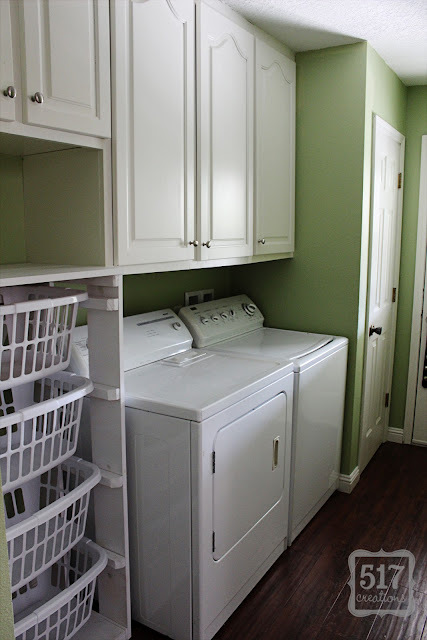 Here's an updated look at our laundry room with the laundry basket dresser. I'm in love! Have you updated any room in your home lately with a little project? A big thanks to my dad for helping me cross some projects off of my ever-growing "to do" list! What a great idea! I've heard of Ana's designs, of course, but I've never made anything of hers. Looks like your dad can just look at a good plan and easily create one of his own! This is a wonderful use of space; I know you're happy to have it. Your blog name has made me really curious. My oldest son's birthday is May 17, and we used to live in the 517 area code, so 517 is a special number to me! I love this idea. I have about the same space on the side of my machines - I'm going to get on my hubby to make me one of these! My son never seems to get his clothes in the dresser so I am going to make this. He can put dirty in 2 of them and clean in the other 2. Carry the baskets of dirty to the laundry and bring them back in the same baskets. Love it.